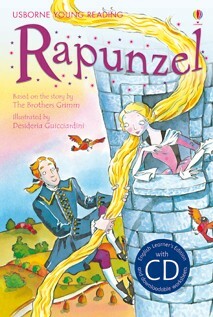 A classic fairytale by the Brothers Grimm, which tells the tale of the beautiful Rapunzel, imprisoned in a tower by an evil witch. Features lively and comical illustrations by Desideria Guicciardini. English Learner's Editions are part of the Usborne Reading Programme developed with reading experts at the University of Roehampton. They come with CD recordings in British and American English and downloadable worksheets and teacher's notes.